Get the best limo hire quotes in Newbury, call Absolute Style Limousines. We are a premium limo hire Newbury company with several years of experience in offering outstanding limo services in and around Newbury. When you use our limo hire Newbury services you will not merely be getting a vehicle and a chauffeur to drive you around but you will get an exceptional experience. Yes, Absolute Style Limousines gives a memorable experience to every customer. Our limo hire Newbury services are geared towards achieving 100% customer satisfaction. You will experience very professional limousine hire services from Absolute Style Limousines. As one of the most experienced limo services in Newbury we know what it takes to provide top-notch limo services. We have the best fleet possible in the region and we have experienced chauffeurs to go with. Choose Absolute Style Limousines and arrive in style on your wedding day. We offer highly comprehensive wedding limo service. When you book your wedding limo at Absolute Style Limousines you will enjoy completely hassle free wedding transportation. We will send you the limo decorated in ribbon of your colour choice. Our well trained chauffeurs know exactly what to do and how to be helpful without intruding in any way. For an impeccable limo hire Newbury service for your wedding well within your budget get in touch with us. Do not finalize your wedding limo before you have received our quote. We screen all our chauffeurs very carefully. Only chauffeurs that clear the CRB screening are made part of Absolute Style Limousines. You can be therefore 100% sure of your personal safety when you choose our limo service. It is not just our wedding limo services are priced low but you will find all our limo hire services including corporate limo services priced very competitively. We guarantee our customers 100% satisfaction regardless of the nature of your requirements. We have beautiful stretch limousines, Chryslers, Super Excursions and much more that will best fit your needs. We serve the entire Newbury and the surrounding areas. It does not matter whether you are looking for flashy limo for your prom, stag and hen night, Valentine’s Day party, soccer matches, concerts, anniversaries birthday parties or just for sightseeing needs. We are here to cater to all your needs and you just need to name your need. Get in touch with us to get your no obligation free quote. 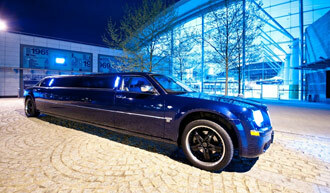 We provide customised limo solutions with custom quote. You can now enjoy fabulous deals at Absolute Style Limousines without having to worry about compromising on the quality of the service in any way. Birthdays, special occasions, wedding car hire, Christmas party nights in Newbury. We are also one of the top specialists in offering corporate limo services. Our corporate services include airport transfers, VIP transportations, limos for promos and road shows. If you want to make an impression then our limousines are the best. No matter whether it is a personal limo hire need or a corporate need, we are with you to support you in the best way possible. Book our Exclusive 16 seater!